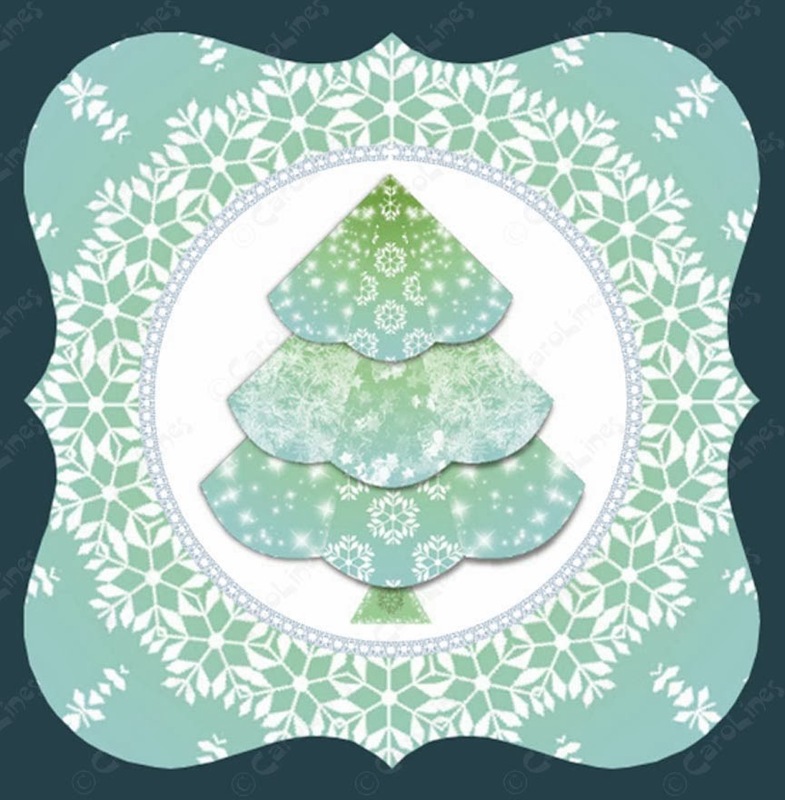 This card uses the Snowflake Patchwork kit and 2 papers from the Frosty Papers Collection. 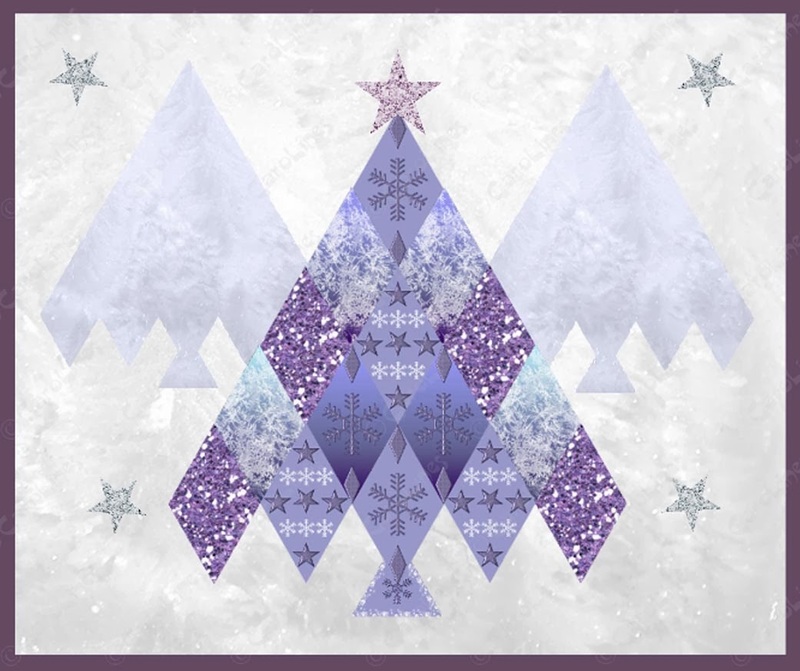 The Patchwork Diamonds were positioned to make a tree as illustrated, then grouped and re-sized. The base of the tree was one of the Patchwork Triangles. The tree was then moved to the My Digikit punch feature. 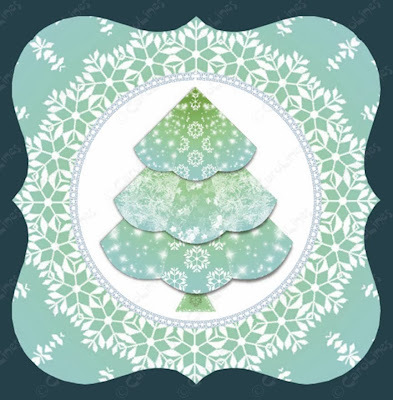 The lilac frosty paper was imported and the tree punched from...copied and pasted to make another. The white frosty paper was re-sized and cropped, the trees positioned and a border made by placing a dark purple oblong behind the arrangement. The stars were from the Layered Christmas Trees Part 2 kit. This time the Patchwork Fan Segments were used. They were arranged as illustrated to make a tree, with a triangle as the base. The tree was saved in the task bar and the one in the workspace was converted to a picture. It was then opened in Photolab, distort (top right button) and kaleidoscope. The image was then manipulated using the image and angle slider until a doily-like pattern appeared. Once back in the workspace, the fancy square was punched from it. A white circle was created and re-sized to fit inside the 'doily' and the tree re-sized and positioned in the centre. One of the lace brushes (re-coloured) was used to make a border round the circle. Lastly, a dark turquoise square placed behind to complete the card.